I’m so happy to report that in week 3 I made progress! Way more than I had planned and now I’m extremely focused on getting the entire room done. I’m still figuring out a couple more pieces of furniture, but otherwise I’m moving along on my projects. 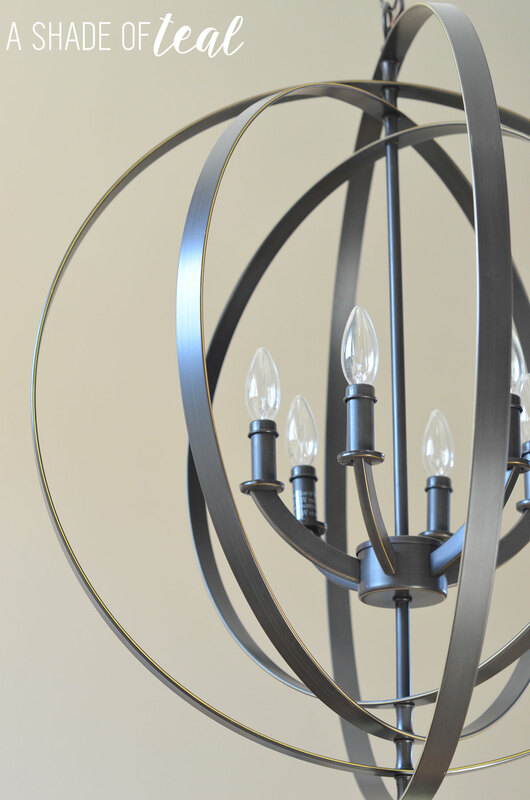 For starters, my new foyer light and chandelier are installed! If you remember from last week I showed you the before and what I picked out. 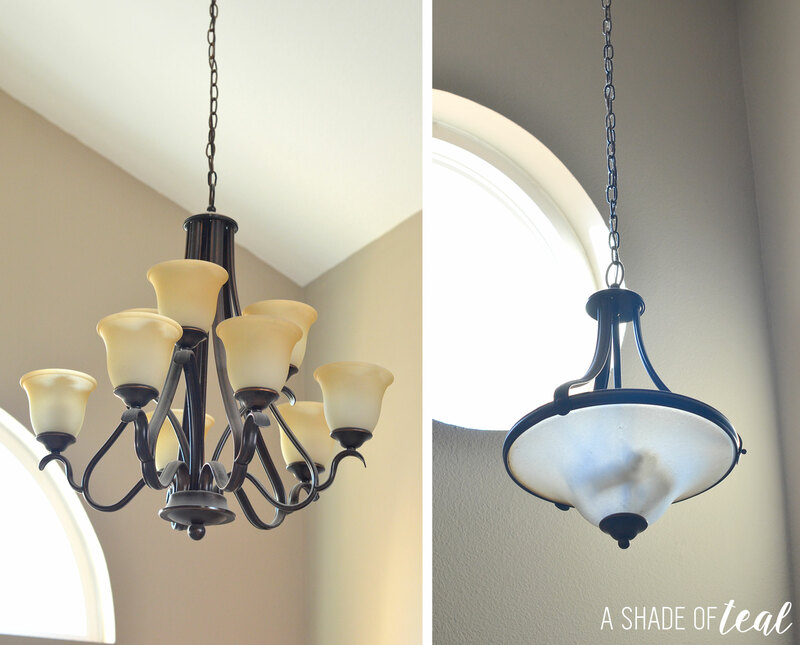 Both are from Lowe’s and are the Progress Lighting Equinox Antique Bronze Globe Chandelier. Here’s the before again. And now! 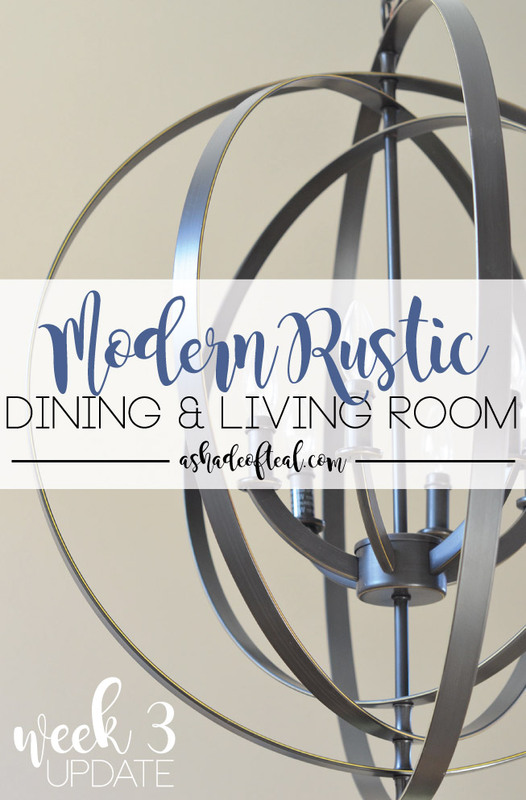 The dining room chandelier is the left and the foyer/entry light on the right. I love how they look and can’t wait to get a table under the chandelier! Next, I installed all my base molding! Woohoo!!! I’m still painting as we speak but having it installed is a huge relief. For some reason I dread working on molding. It’s so easy but I tend to always put it off. This week I received some more packages, one being this guy! 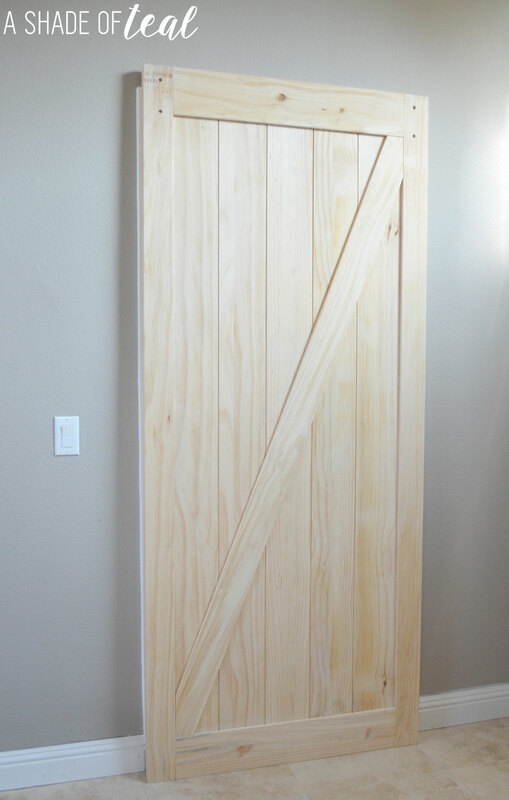 It’s the “Solid Core Z-Frame Soft Close Pine Barn Interior Door” from Lowe’s. This is where it will go, separating our kitchen from the dining room. I’ve always wanted a barn door and this is the perfect place for it. I hope to have it installed by next week. 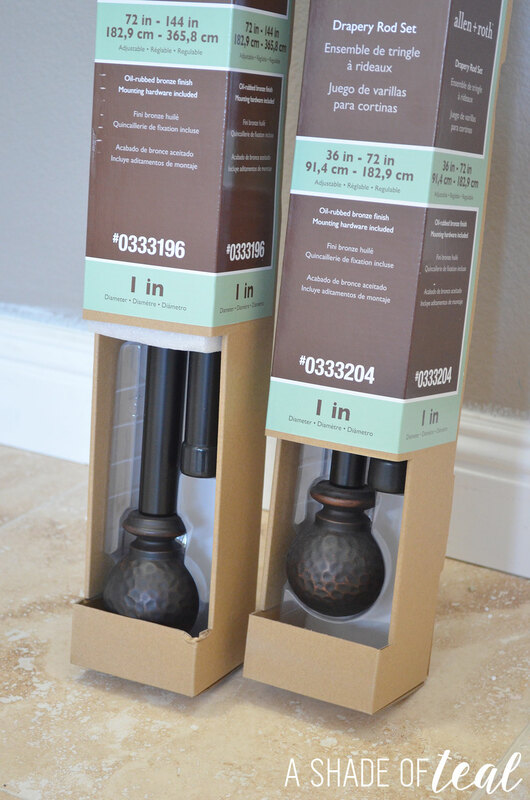 I also received my Allen + Roth Curtain Rod’s, also from Lowe’s. I still need to get curtains, but once I have those I can hang these up. 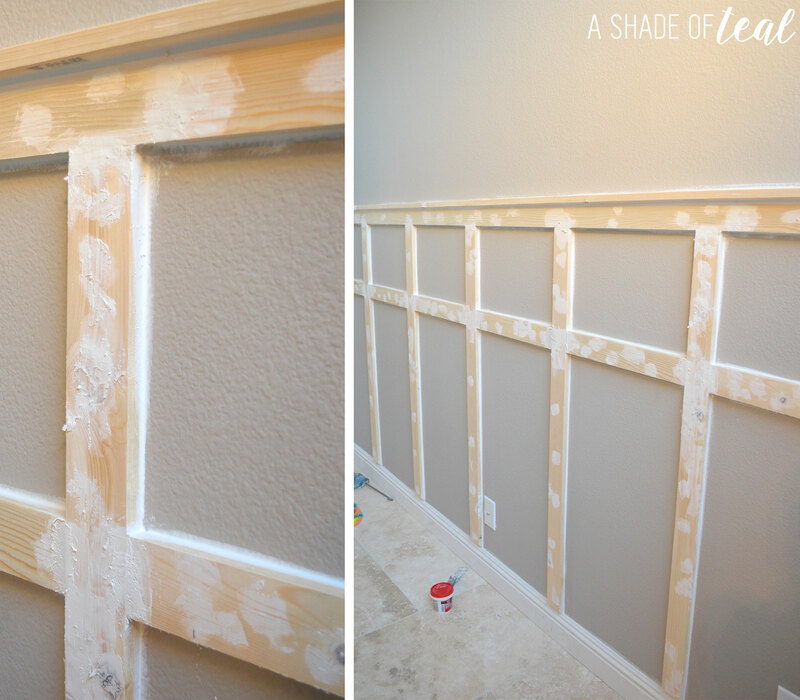 Finally, my accent board & batten wall is up! Another Woohoo is needed! It’s installed and prepped to be painted. Once this wall is done I can start moving in some furniture. Love the lighting, I have the same fixture in my office and I love it. Looks like a lot of progress going on, looks great. 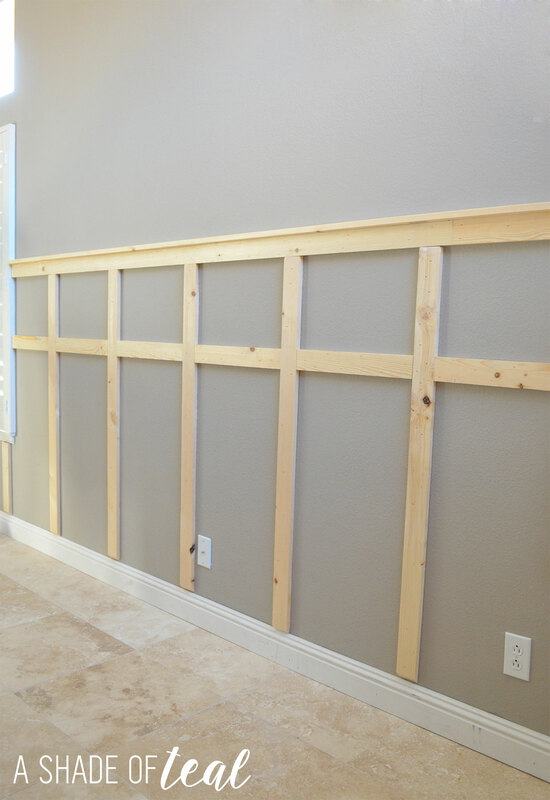 I am so excited about your batten board, Thats what I want to put up on my walls, do you have the tutorial for that?, I am sure I can find one online. Ahh, it’s looking awesome! 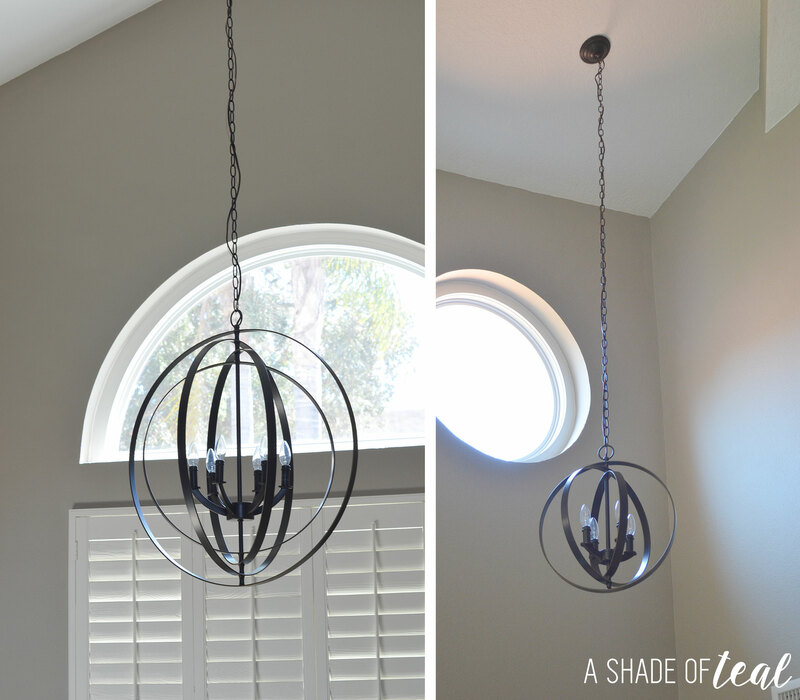 LOVE the light fixture! I can’t wait to see that accent wall all painted. 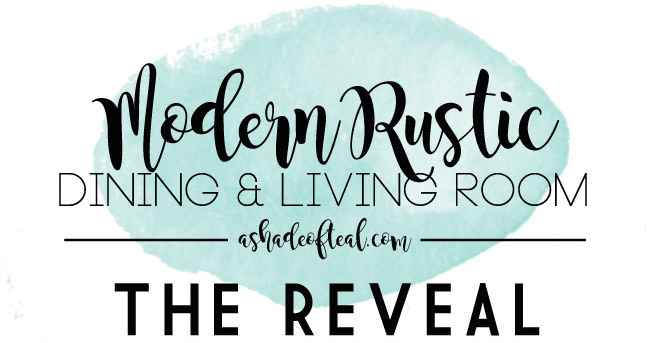 The barn door is going to look amazing too! Good luck and can’t wait to see the final results. That chair rail is looking good! And those light fixtures are perfect now that they’re in the space. Looking good! you have made some awesome progress! love the plan! Wow! The lights look great and I love the door! Can’t wait to see what you get done next week! Go get ’em girl! OOO-WEE!!! That’s some chandy-candy right there! Awesome progress on the ORC this week. I hope to get as much accomplished as you for next week. Looking great!! you’ve made a ton of progress. LOVE the barn door and the DIY board and battan! WOW! You’re really motoring along. Lots of progress! Love your new lights! Wow!! I love that light! The board and batten is going to look so AWESOME!! I can’t wait to see everything come together soon! It all looks so great so far and can’t wait to see the progress! Love all your style choices!